(Bloomberg) -- For U.S. Senator Chris Murphy, Duke basketball phenom Zion Williamson’s disintegrating shoe was the final straw. A long-time college sports fan, the Connecticut Democrat has watched as athletic budgets ballooned to $200 million and TV rights delivered billions to the National Collegiate Athletic Association. When Williamson tore through his Nike sneaker in a game earlier this year, a malfunction that moved Nike Inc.’s stock, Murphy felt compelled to add his voice to the chorus of people pushing for college athletes to receive more of the money they generate. Calling the treatment of college athletes a “civil rights issue,” Murphy put together a 14-page report titled “Madness, Inc.” Due for release Thursday morning, it details the growing commercialization of college sports. Among the highlights: Athletic departments generated over $14 billion in revenue last year on their own and through institutional support, up from $4 billion in 2003. At the five richest conferences, 12 percent of revenue went to student-athlete scholarships, while 16 percent went to coaches’ pay. The highest-paid public employee in 41 states is a football or basketball coach. The timing of the release isn’t a coincidence. It’s meant to coincide with the NCAA men’s basketball tournament, the organization’s most important annual event. 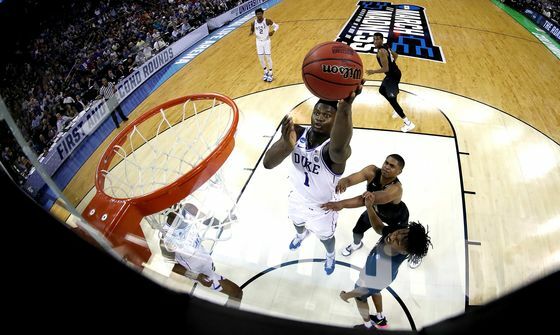 The NCAA will be paid over $800 million for the tournament, just a small percentage of the tens of billions that are generated by college sports, primarily in the form of media rights, sponsorships, advertising and ticket sales. The NCAA is appealing a federal court’s decision that its compensation rules for athletes violated antitrust law. A new advocacy group formed to give legal aid to college athletes. Two congressmen introduced bipartisan legislation aimed at getting the NCAA to allow students to market themselves. College sports was dragged into an admissions scandal, in which parents are alleged to have bribed coaches to help their kids get into elite schools. Celebrity lawyer Michael Avenatti was accused of trying to extort Nike Inc. He claimed he had evidence the company was helping funnel money to elite recruits. The NCAA has said in the past it agrees with the need for change, but that it is “properly positioned” to achieve reform. Murphy plans to release more reports on college sports in the coming months. Other topics he intends to cover include the nature of amateurism, the long-term health consequences for former student-athletes, and the ways schools fail to fully educate their athletes.